Please refer to our stock # 2036 when inquiring. Tibetan Copper / Brass Gao Prayer Box with Tsa Tsa, memorial Buddha statue dedicated to ill or deceased, circa 1890. Embroidered cover with delicate stitching from early 20th Century. 3 3/4" high. According to Prayer Boxes, The major religion in Tibet is Buddhism. Followers of Tibetan Buddhism make use of a type of prayer box known as a Gao (sometimes spelled "Gau" or "Ghau"). Gao amulets are also found in Nepal, Mongolia and Bhutan. Most are made of silver, but gold, brass and other metals may also be used. An ornate pattern is usually engraved on the box, as well. The gao is used within this tradition as an amulet - a ritualistic object believed to provide protection from evil. A gao box is often embedded with semi-precious or precious stones or coral. Turquoise and red coral are especially favored in the design of Tibetan prayer boxes. Other gems used often by the Tibetan silversmith are amber, lapis lazuli carnelian, garnets, amethyst, and even rubies, sapphires and emeralds. The gao is usually worn around the neck and hung close to the heart. Within it is placed a scroll upon which is written or printed a prayer or sacred symbol. These scrolls are typically prepared and blessed by a Buddhist priest. In this use, the gao is not unlike a transportable shrine. In lieu of a prayer, the gao might also be used as a container for holding herbs, stones or other objects believed to have protective powers. 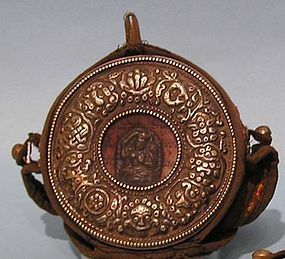 The Tibetan Buddhist might also place an image of Buddha or other deity inside the prayer box. A gao might even be designed with an opening that allows the person to view the image throughout the day. Alternatively, a cast form of the deity may ornate the surface of the gao.